Oh, my! 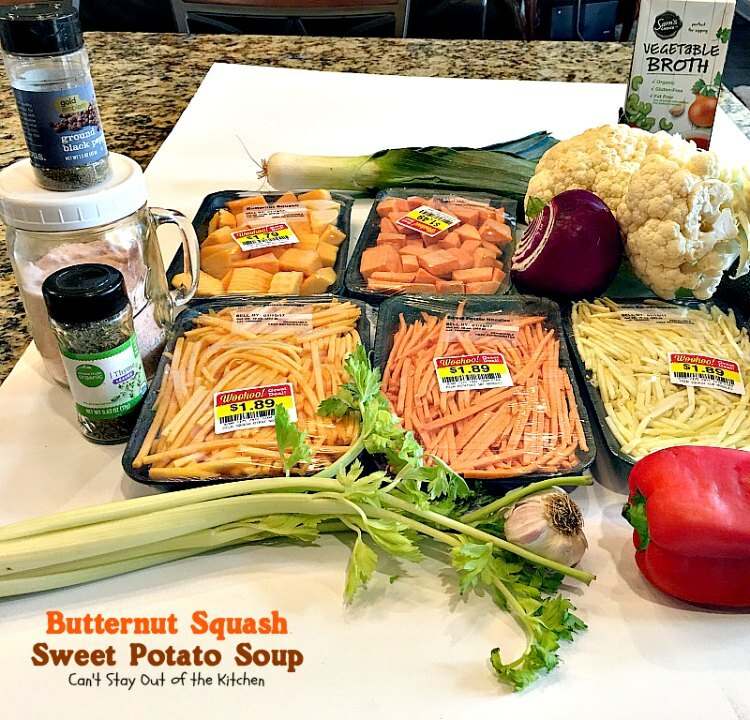 Butternut Squash Sweet Potato Soup is not only healthy, low calorie, vegan and gluten free, but it’s also delicious! 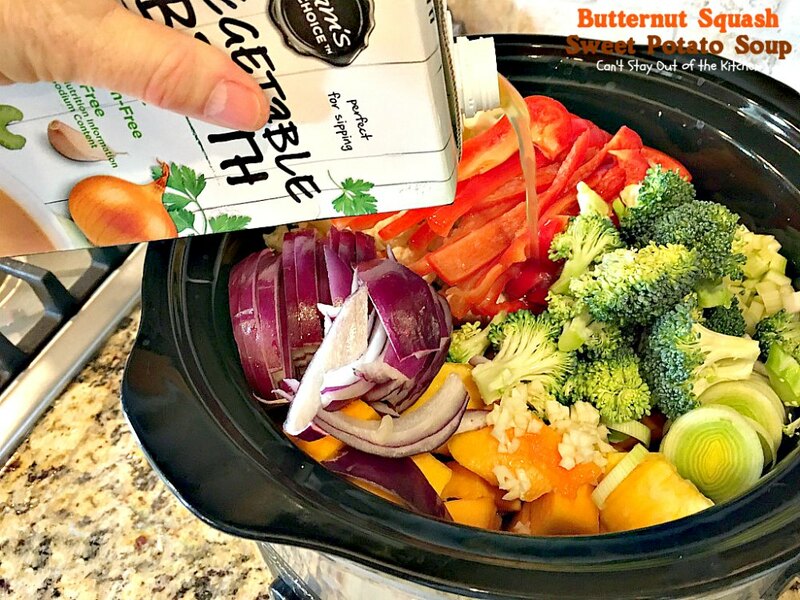 This slow cooker recipe is chocked full of fresh veggies providing outstanding taste and texture. Some of the veggies are julienned or spiralized and others are cubed displaying a delightfully diverse appearance. It sure makes the soup more interesting! 🙂 After the soup cooked in the crockpot I added partially mashed, cooked red potatoes to thicken the soup a little without using any milk or cheese. 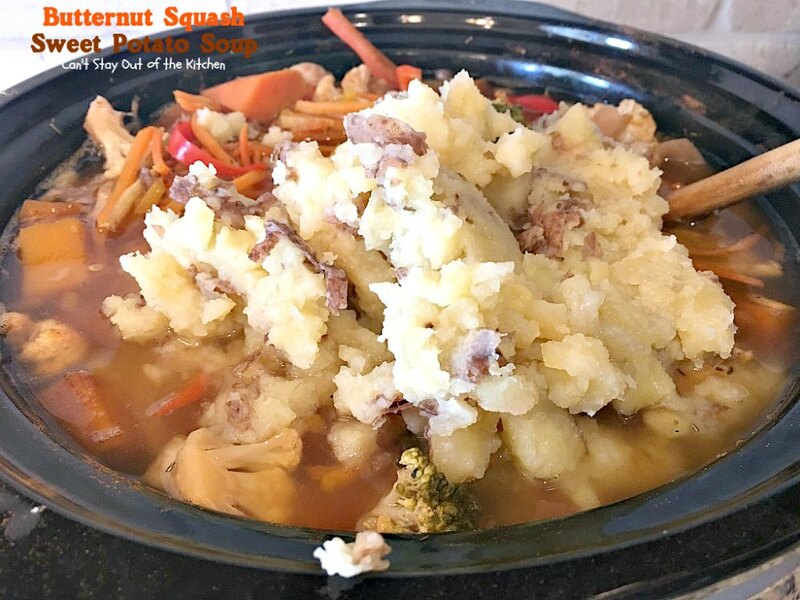 By now, if you follow my blog you’ll see that while it is eclectic in selections of food, about one-fourth of my posts are given over to soups or chilies, another fourth to salads, and another fourth is given over to cookies and brownies. I suppose because those things are so easy to make, and I’m really into E-A-S-Y as I get older. And, yes, I love my breads, too, although I don’t eat them near as much any more. Still, I hope you don’t mind me rolling out ANOTHER soup recipe! John was out grocery shopping in January, and as is his custom, he usually finds great deals. (I’m never able to find those deals!!!) 🙁 Anyway, he found close outs at Kroger for squash, butternut squash and sweet potatoes. Plus, I already had a lot of other veggies on hand. So I decided to try my hand on a crockpot style, throw everything into the pot kind of soup. 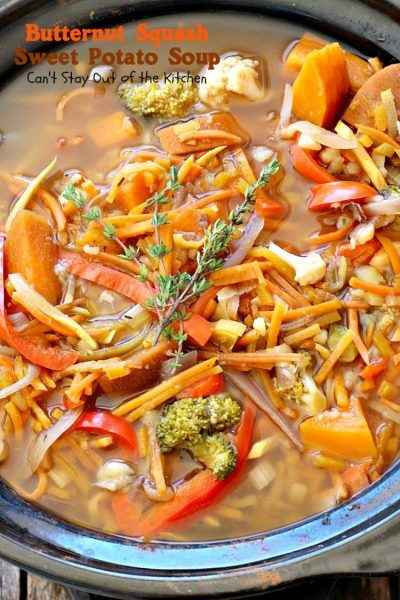 Thyme and rosemary were the perfect seasonings for this clean-eating and tasty soup. I love eating lots of veggies, and this soothing, comforting soup sure does the trick if you’re wanting something fairly easy. This recipe is something that’s great to throw together on a Saturday morning and eat for dinner that night and have for lunches throughout the work week. If you’re looking for a way to maintain your health (and weight), then give my crockpot Butternut Squash Sweet Potato Soup a try. If you don’t want to spiralize or julienne your veggies, then you can chunk them and still maintain the amazing flavors. This recipe makes a LOT, so feel free to cut it down if you don’t want leftovers….although this is great served as leftovers. 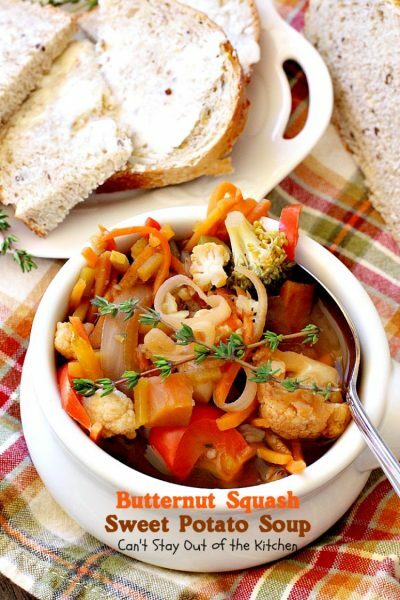 Add a few slices of your favorite bread and you’ll be in seventh heaven. Butternut Squash Sweet Potato Soup is so tasty and has wonderful texture. This is a great soup to make up if you have a garden and are trying to use up a lot of fresh veggies. Serve Butternut Squash Sweet Potato Bread with your favorite bread for a hearty, very satisfying meal. I used these ingredients plus crushed rosemary, broccoli, red potatoes and matchsticks carrots. 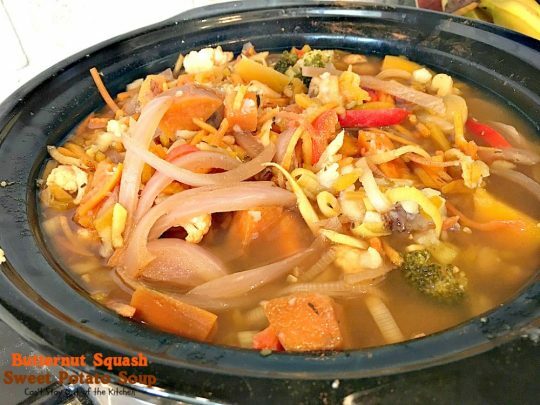 Place sweet potatoes (both spiralized and cubed), butternut squash (both spiralized and cubed), yellow squash, matchsticks carrots, leek, celery, red onion and cauliflower in a large crockpot. Add red pepper, broccoli, garlic, vegetable broth and seasonings. Cover and cook on high approximately 3 hours. Meanwhile, boil red potatoes until tender. Mash with a potato masher (not with a mixer), so potatoes still have chunks and are NOT smooth. 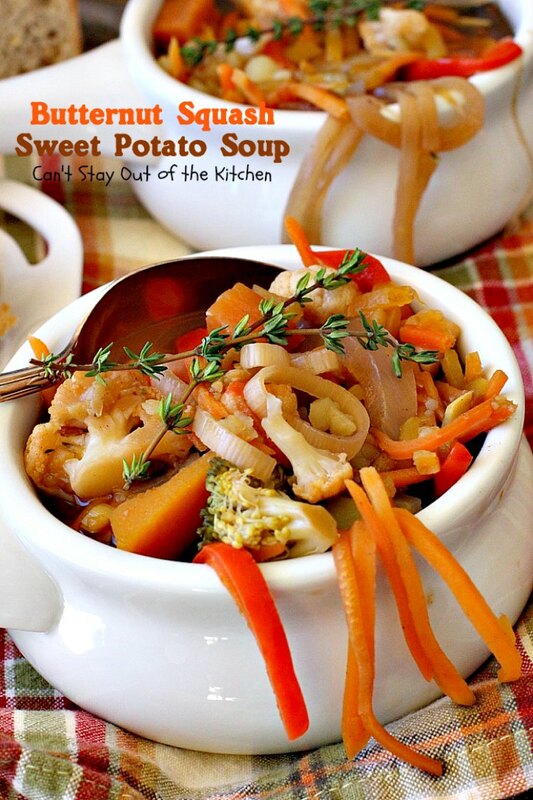 Stir potatoes into crockpot to thicken soup. Heat through another 5-10 minutes before serving. Garnish soup with fresh thyme before serving. 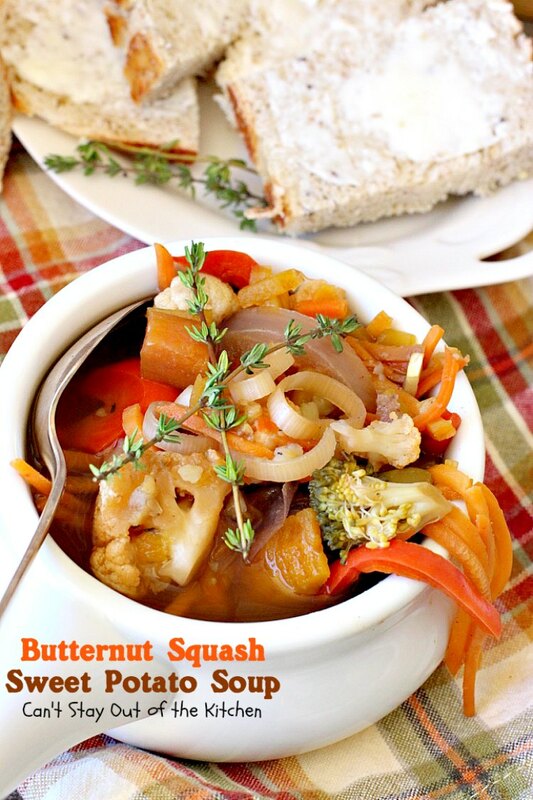 The long strips of veggies causes this soup to have a delightful texture. This is not your average soup! This delicious soup is chocked full of fresh veggies and seasoned with thyme and rosemary. 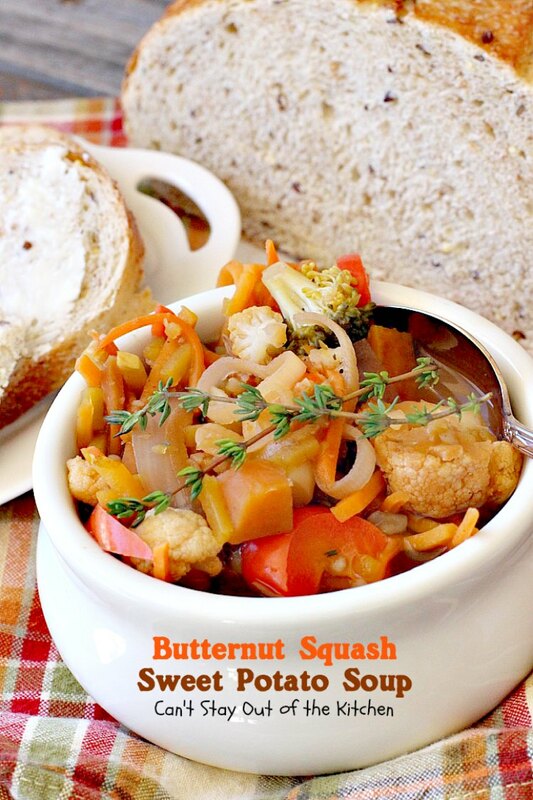 It's a hearty and filling comfort food that's also healthy, low calorie, gluten free, vegan and clean eating. On top of that it's made in the crockpot so it's easy! 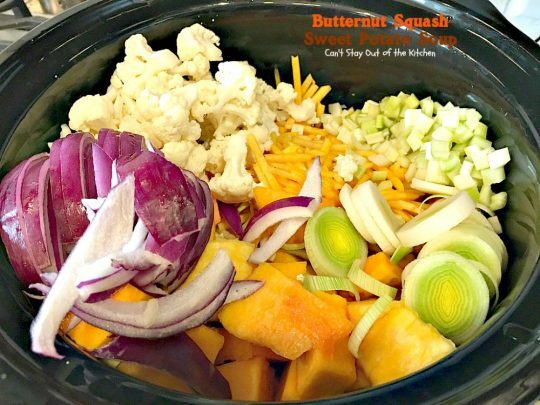 Place butternut squash, sweet potatoes, yellow squash, leek, onion, red bell pepper strips, cauliflower florets, broccoli florets, carrots and garlic in a large crockpot. Add vegetable broth, salt, pepper, thyme and rosemary. Meanwhile, add red potatoes to a small saucepan filled with water. Mash potatoes with a potato masher so that chunks still remain. 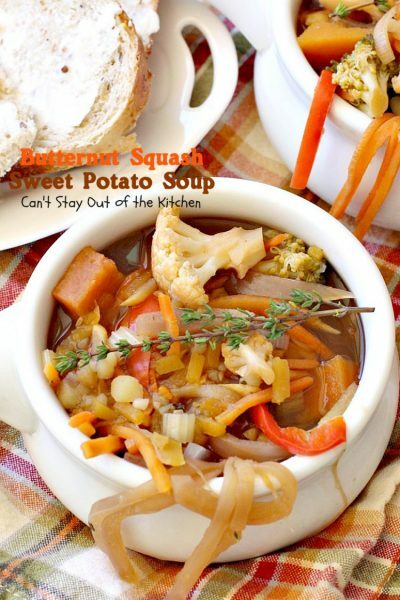 After veggies are cooked, stir in mashed potatoes to thicken soup. Ladle soup into bowls, top with fresh thyme and serve. NOTE: While I chose to use a mix of spiralized veggies and chunked veggies, you can chop the veggies any way you desire. Perhaps this should be called “All but the Kitchen Sink” Soup! 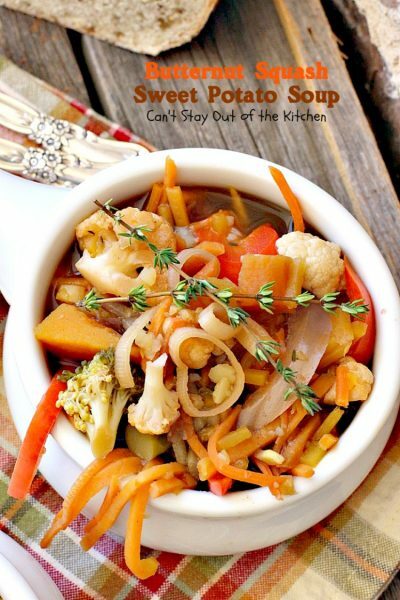 It’s loaded with fresh veggies and it’s healthy, clean eating, low calorie, gluten free and vegan. 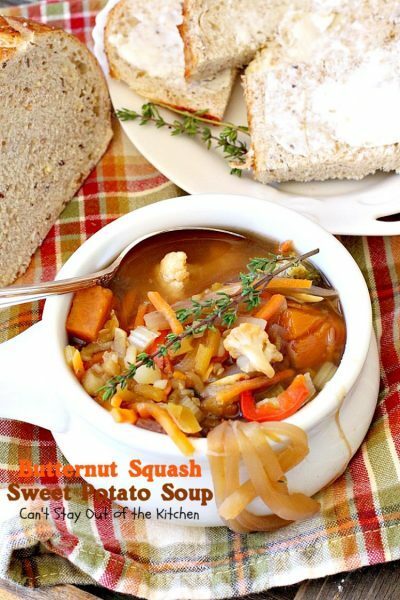 Enjoy a hearty bowl of Butternut Squash Sweet Potato Soup the next time you want to enjoy a comforting bowl of soup. This soup is gluten free and vegan for those who want to eat healthy or lose weight! Thanks, Kim. It really is.